I picked up this set alongside the masterclass video from Jamy Ian Swiss, and I'm very happy with my purchase. The cups are simple, but look professional, and will work perfectly well for me. I might upgrade to a fancier appearing set down the road once I've come closer to mastering them, but these were perfect for my needs for now. The crochet balls feel really nice, though since one is gimmicked and somewhat loud when shaken and definitely not examinable by a spectator, I recommend picking up an extra normal crotchet ball or two (in case one gets lost). I believe the size used is the 3/4 inch ones. Closest thing to a negative for me is a lack of a bag to carry them in, but a 5 dollar purchase fixed that right away. 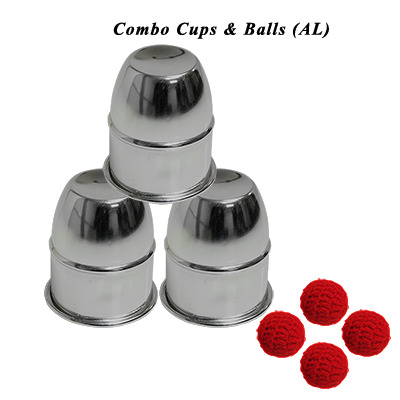 I think this set is best for anyone who wants to learn the classic cups and balls without spending a ton, but wants a professional look that cheaper plastic cups can't provide.